Buzzer now with Bluetooth LE! 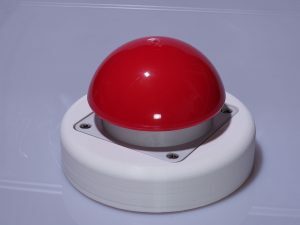 I re-designed my booth buzzer. It now features a Bluetooth LE module that is powered by a LiPo battery. Charging is done through USB. The buzzer is user-configurable to send a mouse click or keyboard click to any device with Bluetooth LE connectivity. For more information see my Buzzer page. Previous Previous post: LED ring now Breeze and DSLRBooth compatible!